David DelCollo | Attorney and Aussie Super Fan! Attorney and Aussie Super Fan! Pittsburgh Eats Not to Miss! It is a daily routine: my dog, Marley and I wake up early and go for a long walk, followed by a short game of frisbee, and finally breakfast. It is all smiles for Marley until I turn on the shower to begin getting ready for work,-that is her cue that I will soon be leaving for the day and it is at this point that her whole demeanor transforms. She goes from the energetic, happy dog to very lethargic with a look on her face that always breaks my heart. The Television Baby-sitter. Since our dogs are very accustomed to our televisions being on when we are home, a quiet-home when we are away can be deafeningly silent. Keeping the television on will create the same ambiance and atmosphere that exists when we are home with the dog and lounging on the sofa. My personal favorite is Animal Planet (Pitbulls & Parolees), as there are a lot of dog shows on during the day filled with barking and animal sounds that will give your furry friend the feeling of being surrounding by others. Bird (and squirrel) Watching. If your dog is anything like mine, they can spend countless hours watching and dreaming of the day that they will finally catch one of those squirrels. If you have a window facing a tree or some area where there are a lot of birds, make this area comfortable for your dog to sit for a while and observe. Maybe use a cushion, dog bed, or blanket to make this area more inviting and once they are start getting absorbed into watching the great outdoors, hours will pass by and maybe even a good nap will ensue. A Tired Dog is a Sleepy Dog. On average, dogs can sleep about 16 hours a day and unless you work in a sweatshop, this should mean that they can spend a majority of your working hours catching up on sleep. This is especially true if you can tire your dog out a bit before you head out the door in the morning. The Peanut-Butter Solution. If your dog is anything like Marley, my Aussie, then they absolutely love peanut butter. Use this to your advantage by taking a healthy wad of peanut-butter and sloshing it in one of their favorite toys. The peanut butter will pack into the crevices, keeping your dog busy for hours while they attempt to get every last drop of peanut creamy goodness into their bellies. If you don’t have any toys that will work well for this, the pet store also sells a variety of fillable toys for this very purpose. Keep Some Light on the Subject. Similar to the television, when we are home with our dogs we usually have some or most of the lights lit. While I am not recommending that you waste energy when you are away, keep some lights on in those areas where you usually spend the most time with your pet. A home that contains a lot of the same activity as when you are there with the dog creates an atmosphere that is comforting and soothing to the dog. We want to try to stay away from creating a drastically different environment in the home when we leave for the day, as this makes it much more easy for your animal to cope with your absence. Hang on to that Old T-shirt. A piece of your clothing that retains your scent or even a blanket that you have used often can be a great security object for your dog when you are away. As we all know, dog’s are very intuitive creatures that utilize familiar scents in order to provide them with information on their surroundings and circumstances. Having a scented object that your dog can lie with makes the dog feel your presence even when you are not there. Also, leaving a scented object with your dog can help your dog to understand and learn that you have not left for good, which is the dog’s greatest fear every time you step away. I recommend keeping some old t-shirts in a special place and when you leave for the day, get one out and place it where your dog likes to lay. The Day-Care Option. We now have the option of doggy day-cares, something unheard only a few decades ago. Most doggy day-cares today resemble those of child day-cares, in that they are open environments in which the dogs can play and interact under the supervision of a trained staff member, with some even offering nap-time, snacks, and games. Most doggy day-cares range from about $15-$35 dollars per day, depending on the facility and the services offered. Even if you do not have the finances or desire to bring your dog to a day care every day you are away, bringing your dog a few times a week can break up the monotony and long-stretch your dog is alone between your days off. These facilities are also great because they provide your dog with the opportunity to socialize with other animals and become an overall more well-rounded and happy animal. The Doggysitters Club. Similar to babysitters, there are many people that will come to your home and spend time with your dog during the day when you are away. My favorite resource for this is Rover.com, which is a website that matches people with dog sitters. On this site you can search by area, see their rates, read reviews, and even shoot your potential dog sitter with an email to discuss their services further. In addition, you can hire someone for as little as 15 minutes to just stop by, check on your dog, and take them for a brief walk, or you can hire someone to watch your dog for days,-as well as everything in between. 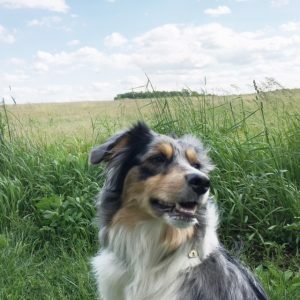 I think this is an amazing resource in curing your dog’s blues. 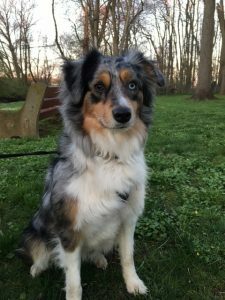 Is the Australian Shepherd Right for Me? With so many variations of dog breeds on the market today, it can become very difficult for one to determine which dog is the right fit. While most people will choose a dog primarily because of its outward appearance, one should really take some time to consider what type of temperament will be most fitting with their own personality. In making this determination, one should consider their overall lifestyle including, activity level, living conditions, work schedule, available resources, family structure, and ultimately, what type of experience you are seeking with a dog. The ideal dog for a person who has a very demanding work schedule may be completely different for a person that is home all the time. Similarly, the ideal dog may differ for a person who is very active and loves to exercise as opposed to a person who is less active and enjoys staying indoors. It is important to perform a very thorough and honest assessment of one’s lifestyle in order to assure that both the dog and the owner have the most positive experience possible. Marley is my one-year old Australian Shepherd. I actually was not out seeking a dog when I found her, I just saw her one day and thought she was an amazing puppy. Prior to taking her though, I did some research on the Australian Shepherd to find out a bit more about the breed and temperament. The Australian Shepherd is a medium size breed of dog that, unlike their name, was actually developed on the ranches of the western United States. With the boom of the west and cattle work in the early 1800s, the breed quickly rose to popularity as their trainability, eagerness to please, and obedience skills made them the most effective cattle dog ever seen by ranch hands. The Australian Shepherd was a particularly tireless sheep herder in the vast Rocky Mountains and it was here that the ranchers of Boulder, Colorado began breeding the dogs and touting them as legendary sheep herders that began to attract purchasers from as far west as California. The ranchers also found that the Aussie had the ability to handle extreme weather, have plenty of speed, athleticism, energy, and endurance; and are intelligent, flexible, and independent. The ability of the breed to adapt to any situation and think for itself makes it an excellent all-around worker. While all of these characteristics really made the Australian Shepherd an exceptional cattle dog, there was one trait of the Australian Shepherd that truly distinguished it from the other breeds; its unparalleled loyalty. Often referred to as “Velco Dogs,” Aussies have a strong desire to be near their owners and they often form an intense and devoted bond with no more than a few very specific people, as the Aussie tends to be very selective. The Australian Shepherd is known for displaying reserved and cautious behaviors with those that are unfamiliar and it is often known for displaying guarding behaviors towards its owner and its property. Having been bred to work, the Aussie does best when it is provided a “job” and given the ability to please its owner by doing that job well. This often means that a bored, neglected, unexercised Aussie may invent its own games, activities, and jobs, which to an inattentive owner may appear to be hyperactivity. Without something to keep the Aussie’s sharp brain stimulated, they can sometimes become destructive, however, this is often only due to lack of mental stimulation. Keeping all of this research in mind, I then examined my own personal lifestyle. I am a pretty-active person and I usually spend my free time outside. I love going hiking and exploring in the woods. I also enjoy working out and trying to keep a very active lifestyle. Being that I am an attorney, I tend to work a lot of hours, however, besides being at work I do not have a great many things that require my time and attention. While I do not live on a farm with lots of open land and space, I do have a great deal of dog parks and natural forests pretty close to my home. 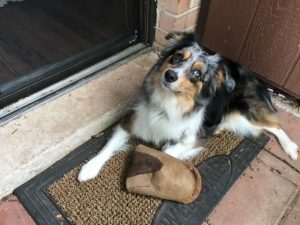 So is the Australian Shepherd a good fit for me? Well, it is a bit too late for that because I have had Marley for about a year now. In a perfect world I would live on a ranch with lots of cattle and Marley would run and herd from sunrise to sunset as we would tirelessly work the land together, just like her breed was intended. But I am an attorney living in a townhome in the suburbs of Philadelphia and the closest Marley gets to herding cattle on the ranch is chasing the squirrels in the park behind my home. But I do give her all the love that I have to give and I cherish every moment I get with her and there is nothing else that makes her happier than to just be with me. Are you in the market for a new dog? The American Kennel Club recognizes hundreds of individual dog breeds, so you certainly won’t hurt for choice. Of course, not all breeds are created equal. Some AKC breeds are immediately recognizable by their names and profiles: Border Collies, Huskies, Labrador Retrievers and many others. Some breeds are more obscure, even if they’re similar to better-known varieties. And some breeds occupy a middle ground — you’d probably recognize them if you passed them on the street, but their names might escape you. Whether you’re a fan of big, rambunctious dogs or small, tidy pups, it’s hard to go wrong with these five breeds. All are super popular right now, which is great news if you’re looking to bond with fellow owners in your neck of the woods. But be responsible: Don’t go for an eager breeder or pet shop, which are often in it for the money and don’t have the dogs’—or your—best interest at heart. Talk with your local animal shelter or breed rescue organization to see if they can match you with the dog that’s right for you. Dutch Shepherds are one of the original police dog breeds, and they’ve got the attitude to prove it. Dig deeper, though, and you’ll see why this breed is renowned for its tender heart and protective nature — and why it’s quickly gaining on the better-known German Shepherd. This is an ideal option for families with larger yards. If you live in a smaller space, make sure your Dutchie gets plenty of exercise. French Bulldogs are quite a bit smaller than Dutch Shepherds, but they’re no less lovable. These little bundles of joy are spectacular city dogs. While they can’t quite fit in your handbag, they’re more than happy to curl up on your couch (or, hopefully, the dog bed in the corner). And they play well with others — a must for any canine urbanite. “I had no idea there were so many Australian Shepherd fans in Philly,” says southeastern Pennsylvania attorney David DelCollo, a new Aussie Shepherd owner and fervent convert to the cause. Turns out there are Australian Shepherd fans everywhere, and their numbers are growing fast. Aussie Shepherds have lots of energy and tons of smarts, which isn’t at all surprising for a breed built to outlast the vast herds of sheep dotting Australia’s wide open spaces. This is a great family breed. And you’re right, of course. But miniatures make the cut en masse because, as a group, they’re increasingly popular. Chalk it up to downsizing baby-boomers or eco-conscious millennials; whatever the reason, it’s hard not to walk down the street in any big city without bumping into a miniature breed. So: who’s your mini? Scotties are vivacious, determined — and brutally honest. Put another way, you don’t really know “stubborn” until you’ve spent some time around a Scottish Terrier. That’s actually a blessing in disguise for folks who need to call on these pups’ vermin-hunting skills. And it’s pretty darn adorable regardless. What’s your favorite dog breed? Are you convinced that it’s the right choice for your family? Few things bring more joy than the arrival of a new family member — human or otherwise. Thankfully, millions of Americans happily adopt pets every year, providing new homes to animals who’ve been abused in other settings or face the possibility of euthanasia at traditional animal shelters. Before your pup even sets foot in your new home, identify the room(s) where he or she will be spending most of his or her time — and then dog proof the heck out of the area. Petfinder recommends taping down loose electrical cords and outlets, taking out rugs (unless you don’t mind pee-stained carpeting), removing breakables, installing baby-blocker doors and setting up the pup’s crate with everything he or she will need. These precautions won’t completely preclude messes, but at least they’ll leave your new pooch with less to mess up. According to the Humane Society, one of the most important things you can do in the run-up to your new pet’s homecoming — particularly if he or she is young — is make sure all of your existing pets are healthy. If they haven’t recently been to the vet, bring them in. Make sure all their shots are up to date and properly recorded. Manually check them for parasites and consider giving them prophylactic treatment, just in case. A healthy home means fewer risks for the newest member of your family. Never trained a dog before? No problem; millions of people have, with varying degrees of success. Pick up a couple of dog-training books before bringing your pooch home, and give yourself regular homework assignments to ensure you’re absorbing key concepts. Don’t be afraid to ask for advice from more experienced friends, nor to admit when you’ve made a tactical training error. You’d never totally forget your kids, but all the commotion around your new dog can be a bit of a distraction for parents and kids alike — and that can have unintended consequences. Involve your kids in every aspect of the puppy selection process, within age-appropriate constraints of course, and ensure that they know what to expect when their new friend comes home for the first time. You don’t want a rambunctious or spiteful kid to compound the headache of a rambunctious puppy! When it comes to raising a housebroken pup, patience is a virtue. Your new best friend isn’t going to pick up everything overnight. It’s important to trust your own instincts, your pup’s willingness to learn the rules of the road (or home, as it were) and not to deviate from your training plan. Together, you and your new dog can live in relative harmony. Are you planning to adopt a new puppy anytime soon? Those days seem like a long time ago; now DelCollo and his Australian Shepherd pup are virtually inseparable. She’s energetic, and it’s all DelCollo can do to keep up with her. Were it not for the Philadelphia area’s robust roster of dog parks, he’d likely be at his wits’ end. Harford is a beautiful, 30-acre park in Radnor Township, just northwest of central Philadelphia. It’s an oasis of woodsy calm in the midst of Philly’s bustling suburbs. But it’s not just for dogs; there are miles of walking trails connect to a dense regional network, making Harford Park the perfect stop on a long-distance jaunt across the Pennsylvania countryside. 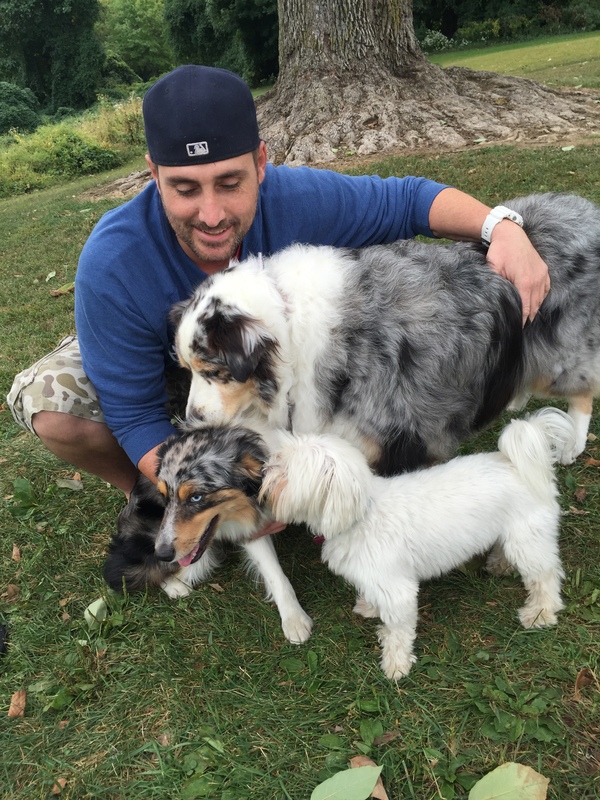 Pawling Farm isn’t just a stunning dog park in the heart of the Philadelphia area. It’s also one of the most historically significant Revolutionary War sites. General Washington’s army spent a substantial amount of time here in 1777 and 1778; the war arguably would have turned out differently had the group not had a chance to rest and recuperate during that famously brutal winter. So don’t just bring the pups — bring the family, too! Norristown Farm Park, a 690-acre expanse of woodland and cultivated areas, also has plenty of historical significance. In fact, it’s one of the oldest continuously operating farms anywhere in the United States — cows have been lowing here since before the Revolution. Dogs love the well-maintained lawns and spacious meadows, while kids and parents are sure to appreciate the period-faithful implements and garb on display. Nestled in the heart of Philadelphia’s vibrant Center City neighborhood, Rittenhouse Square is routinely cited as one of the nation’s best urban parks. With stunning views of the Philadelphia skyline and impeccably groomed lawns and gardens, it’s not hard to see why. The dog-friendly portion of the park is a cosmopolitan meetup space for pups of all shapes and sizes. Mario Lanza Dog Park is an unassuming pocket of quiet amid the hustle and bustle of urban Philadelphia. It’s not particularly large — it doesn’t even take up a full city block — but every square foot of it is well maintained and dog friendly. Schuylkill River Dog Park (say that 10 times fast!) is another urban gem on the west side of Philadelphia. With separate areas for large and small dogs, it’s the perfect place to bring smaller pups without fear of bullying. Plus, there are plenty of dog-friendly restaurants and cafes within a short walk or drive. Lloyd Park has it all: a sturdy fence around the entire perimeter, a burbling brook, beach volleyball courts and a separate kid’s area. In short, there’s something for the entire family, including four-legged members! Beau’s Dream is a bit of a hike from central Philadelphia, but it’s well worth the drive on a nice weekend day. According to BringFido, Beau’s Dream underwent a complete revamp in 2013, transforming from a second-rate municipal-grade park into a regional attraction for dog lovers from a three-state area. What’s your favorite dog park? Which of these sounds most appealing? What’s your favorite dog breed? Most casual dog enthusiasts can name a handful — maybe 10 or 15, on a good day. Golden Retrievers. Labrador Retrievers. Border Collies. Poodles. Cocker Spaniels. Beagles. German Shepherds. Rottweilers. Take your pick. Many of the most prominent dog breeds have been made famous by high-profile enthusiasts or pooches themselves. Others, for whatever reason, simply have a long and celebrated pedigree. The American Kennel Club recognizes more than 180 dog breeds, and it occasionally adds more to the list. In other words, there are a lot of breeds out there that don’t get the press they deserve. One such breed is the Australian Shepherd — recognized in 1991, in case you’re keeping track. Philadelphia lawyer David DelCollo is one of a growing number of proud Aussie Shepherd owners who’s practically evangelistic about the breed’s comportment and suitability. If you’re willing to listen, DelCollo is more than willing to speak. Here’s his take on the 10 best reasons to adopt an Aussie Shepherd. Aussie Shepherds are herders, through and through. That means they get along great with other animals, even if they can be bossy at times. Herding dogs tend to be high on energy. According to DelCollo, there’s rarely a day when his Aussie Shepherd doesn’t want to go for a run outside or head to the park to blow off some steam. This is good news for active puppy parents, or puppy parents with active kids. As long as you’ve got a yard or easy access to a local park, you’ve got it made. Aussie Shepherds are technically medium-sized dogs. They’re fairly tall, but they don’t have the imposing mass of some large dogs — and they’re definitely not the largest of the herders. Aussie Shepherds’ middle-of-the-road size make them ideal for urban, suburban and rural settings — again, as long as they’ve got a place to blow off steam, they’re happy to come home to just about any environment. As herders, Aussie Shepherds love having jobs to do. They’ll play fetch until you’re blue in the face, and are only too happy to inspect the landscaping wherever they happen to be. If you work outdoors, bring your ‘Shep along; they are the perfect helper for a long day of drudgery. Sure, all dogs are loyal. But according to DelCollo’s admittedly anecdotal experience, Aussie Shepherds take loyalty to another level. David DelCollo’s Marley is really smart! Given their herding backgrounds, it shouldn’t be any surprise that Aussie Shepherds are off-the-charts intelligent. They’re quick to recognize patterns and pick up the rules of engagement, making them great play pals. Having such natural intelligence makes Aussie Shepherds great with kids. They know when it’s okay to play — and when it’s time to dial things back and regroup. Once your kids are old enough to stand steadily and interact with agency, they’re old enough to live alongside an Aussie Shepherd. Aussie Shepherds are generally healthy dogs. They have few known genetic conditions or predispositions to specific health problems. As long as they exercise regularly and have tasks to complete, they tend to remain healthy and active well into their senior years. That said, Aussie Shepherds are prone to the same common conditions that affect other dog breeds as they age. Don’t let their natural robustness lull you into a “set it and forget it” approach to their care. Watch carefully for signs of distress and notify your vet whenever necessary. Many dog owners prefer laid-back pets that seem cool with virtually anything. Intellectually speaking, there’s nothing wrong with that. However, DelCollo says laid-back pups put attentive pet owners at a distinct disadvantage. If you don’t really know what your dog is thinking, how can you make sure you’re giving them what they need? According to the American Kennel Club, Aussie Shepherds require weekly grooming. That’s no surprise; they’ve got thick, fairly long wiry fur that can easily get tangled without proper care. But their grooming needs are a far cry from those of curly-haired breeds like poodles. An experienced parent can dispense with his or her Aussie Shepherd’s grooming regimen in 10 or 15 minutes — not an outrageous time commitment by any stretch. 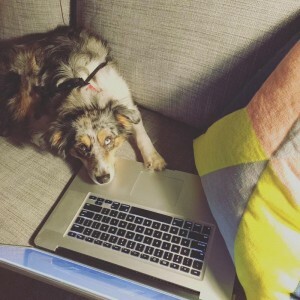 Are you sold on the merits of Aussie Shepherds?